For the 4th True-Life Adventure feature (and 11th film in the series), Walt Disney decided to do something a little different. Instead of focusing on a particular geographic region or a specific breed of animal, he chose to focus on miracles of natures tiniest creatures, including flowers and insects. As a result, it is hard to describe and was even harder to market (look at the lack of explanation in the film's original theatrical poster). Secrets of Life begins with a paint brush in the same fashion as the other True-Life Adventures. The brush takes us through the makeup of our planet. The first topic is plants and how nature helps their seeds get planted. Many unique seeds are shown as they travel and overcome obstacles to germinate. Next, bees collect pollen from the new plants and we follow them into their hive and learn the specifics of their life. From bees, the film transitions into many other types of insects, including ants and grasshoppers. Next the film pops underwater and shows many unique creatures that live their and fascinating specifics of their lives. The film ends with footage of erupting volcanoes creating more land masses. Walt Disney's Secrets of Life premiered on November 16, 1956 and was a big success. Critics praised it for being less slapstick than previous True-Life Adventures and for its revolutionary photography since this was one of the first times that slow motion flower growth was ever photographed. Audiences responded to it as well and it was a success. Many fans of the True-Life Adventures series place Secrets of Life fairly low on their lists of favorites, but in my opinion it is the best in the series. It's diverse subjects prevent it from becoming stale or boring like the others. Production on Secrets of Life required more photographers than any other True-Life Adventures film. The bee sequence alone took three years to shoot. 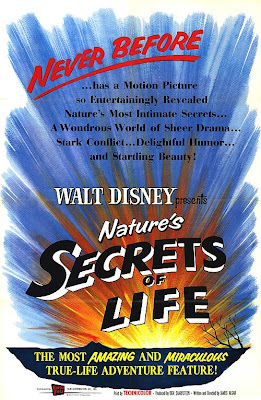 Secrets of Life was released on DVD in 2006 as part of the Walt Disney Legacy Collection. It can be found on the fourth volume of the True-Life Adventures series where it has been fully restored. The DVD is now out of print, but copies are still easy to find. It is also available on iTunes in HD.